The SAPPHIRE GPRO 8200 has been designed to deliver solutions in a variety of commercial sectors. Equipped with 8GB GDDR5 of high speed memory, a single slot low power consumption design, and support for quad 4K UHD resolutions at 60Hz, the GPRO 8200 meets the requirements of professionals in the Digital Signage, HD Multimedia and Medical Spaces. It features SAPPHIRE's award winning Vapor Chamber cooling Technology with two-ball bearing fan, which provides a stable and reliable graphics solution that is capable of meeting exacting commercial standards. The GPRO 8200 comes equipped with the latest DisplayPort technology, DisplayPort 1.4, and is capable of delivering quad 4K UHD display resolutions at both 60Hz and 30Hz for multi-displays solutions. Moreover, the GPRO 8200 supports HEVC (H.265) encode and decode standards and Ultra HD multimedia engines, that obtain the ultimate in video quality for those who require professional standard quality video playback, editing and transcoding used in the broadcast and digital signage segments. 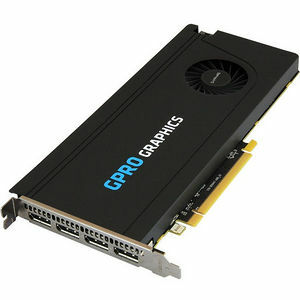 The GPRO 8200 commercial graphics solutions has been engineered to provide innovation and reliability for a wide range of commercial operating environments. With 3 years limited warranty and planned minimum 3 years life-cycle, SAPPHIRE delivers intelligent solutions to commercial spaces with the GPRO range of professional Graphics Solutions.